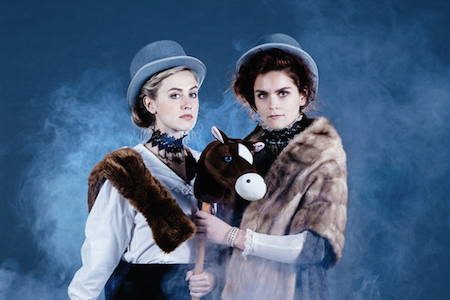 The Templeton Philharmonic, aka Toronto-based sketch comedy duo Briana Templeton and Gwynne Phillips, present their new equestrian-themed show Unbridled & Unstable at this year’s Next Stage Theatre Festival. Right off the top of the show the dynamic duo bursts onto the stage riding stick horses and engages the audience in witty repartee in faux upper crust English accents and their energy never wavers for the duration of the hour-long show which features a collection of roughly a dozen sketches. The quirky dance interludes also do wonders to keep the energy level up between scenes. Templeton and Phillips’ strongest suits are their quirky, outlandish characters and their clever writing which often features pithy, observational humour. Highlights for me include a sketch where one character fakes her way through a book club meeting having never read the book, Phillips’ character awkwardly skirts, diverts and vaguely answers questions in this little gem of situational humour, and the sketch where Templeton skewers period romance novel clichés as the Silvia P. Drinkwater, a hilarious send-up of a romance novelist that had the audience roaring with laughter. Not all the sketches worked; I thought the scene featuring a real estate agent spiralled quickly into the absurd and dragged, Phillips’ drunk aunt flipping through a photo album was more awkward than funny and a bit taking place at Woodbine race track where audience volunteers are called up on stage is more trouble than it was worth, but these few missteps are quickly swept off the scene in the fast-paced show and I thought that the really funny scenes outnumbered the few that didn’t quite land in the right spot. A lot of these sketches had been done before by them. I know they don’t promise new work but I’m not sure why the sketches weren’t honed and really tight because they have had them for ages. The whole thing just seemed ramshackle and unthought to me. It’s not equestrian themed…there’s one horse bit at the end and a disaster about woodbine in the middle. cues are sloppy…. I think these two really need a director. There are some basic rookie mistakes that make me think they aren’t ready for NextStage yet, although from wath I saw this year Next Stage is a very amateur festival, exactly same quality as fringe. Hit and miss. This show was miss for me.